If you ask dental patients in the Herndon, Vienna, and Sterling what they hate the most about dental visits, chances are that they’ll mention the drill. Just the sound of it is enough to make many people nervous or anxious. Usually, patients of all ages mention how the sound of a drill can give them dental anxiety. 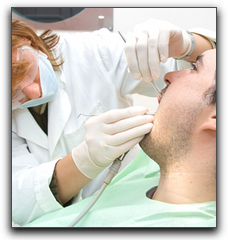 Some patients even avoid regular checkups, causing their current oral health to decline. When this happens, the likelihood of patients with tooth decay requiring root canals increases. Many residents of Reston, Virginia may wonder if there will ever be an alternative to the dreaded dental drill. Guess what? Now there is! At Expressions Dental Care, we want our patients to be aware of the latest dental technology available, especially as it pertains to cosmetic or family dentistry in Reston. If you are in need of quality dental care in the Reston area, or if you are interested in a smile makeover, give Expressions Dental Care a call at 703-757-6453. We can answer any questions you may have about the procedures and treatments we offer. We also offer other dental services such as teeth whitening, veneers, gum contouring, dental implants, or family dentistry in Reston. Make your appointment today so your teeth can look and feel their best!